I write in my pajamas, take daily naps, work four-day weeks, watch Netflix and play Facebook games all day. That’s what some of my friends think the freelance life is all about. “You’re so lucky,” they say with envy. But that’s not exactly how it works. Allow me to explain. 1) Writing in my pajamas: I write in my pajamas…sometimes, maybe 10% of the time, but only because I get up in the middle of the night to write down an idea before I lose it. After working on a story all day, I sometimes get stuck on the lede, but once I go to sleep, my creativity percolates and the lede writes itself. I have to capture it before I lose it, and that often happens when I’m in my pajamas. The rest of the time I’m dressed for the day, just like everyone else. 2) Daily naps: Yes, I take a nap almost every day, and I won’t apologize for it. I need my naps to recharge after the early morning dashes to my computer, and sometimes just to give my brain a rest from writing, editing, researching and managing the day-to-day tasks that go along with owning a business. In addition, I have to adjust my schedule to other time zones, which sometimes means I have to be up as early as 4 a.m. PST for early morning calls with my East Coast friends and colleagues, but still be available to editors and clients on the West Coast after 5 p.m. PST. 3) Four-day weeks: Ha! I wish. I usually work at least a five-day week, taking Fridays and Saturdays off, but any freelancer knows you work when you need to. Some days I’ll put in 12 to 14 hours, others maybe only six, but this usually spreads out over at least five days a week, and often more. And let’s not even talk about vacations. What?!! 4) Netflix: I’ll confess. I do watch Netflix sometimes, but only after 5 p.m. PST and only if my writing and editing work is done. I watch old episodes of Mad Men while I’m doing my bookkeeping, filing, planning for the next day or other tasks that don’t require 100% of my attention. It’s my reward after a long day. Sometimes this down time even includes a glass of wine. 5) Facebook games: If I am in the office all day, I typically have Facebook and Twitter open on a separate monitor on my desktop. 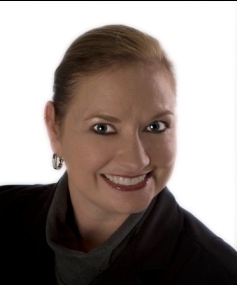 This allows me to monitor activity on my iLoveKent and Virtually Yourz pages, but also to keep up with the day’s news and to connect with my freelance friends (see my previous post on fostering freelance relationships). I play the occasional game, but it doesn’t amount to more than 10 minutes every couple of weeks. 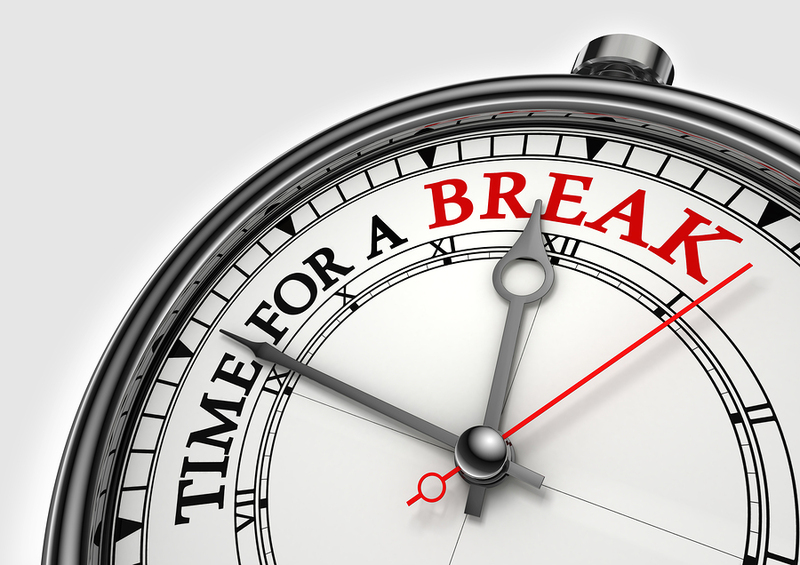 And when I’m writing or editing, I shut everything down – Facebook, Twitter, email, cell phone, etc. Based in the Seattle area, Dana Neuts of Virtually Yourz has been a freelance journalist for 10 years, specializing in business, feature and community writing. 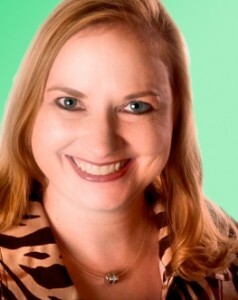 She is also the publisher of iLoveKent.net, which won a 2nd place award in the 2012 NW Excellence in Journalism contest for “Best Online Community Engagement.” She was named Regional Director of the Year in 2012, is currently serving as the national SPJ Secretary/Treasurer and will run for President-Elect in August 2013. Follow her on Twitter @VirtuallyYourz and @SPJDana. In this New York Times blog post from 12/13/11, David Carr features a recent report by the Committee to Protect Journalists that shows more journalists were jailed in 2011 than the previous year. At least 178 journalists were jailed this year, including at least 79 who are freelancers, who often lack the institutional support and financial resources to fight wrongful imprisonment. For more on the subject, read the original blog post which includes a list of the imprisoned journalists. It’s countdown time. We’ve entered the 12 days of Christmas and since most journalists don’t need geese-a-laying or drummers drumming, you’ll have to find some other options. No worries, though, we’ve got a countdown of some great gifts that are a bit more practical. 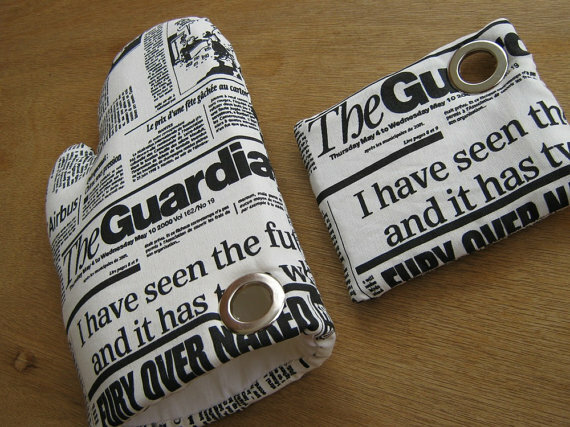 12: Although some reporters don’t always have time to eat, let alone cook, you might know one or two that would appreciate this creative set of an oven mitt and pot holder, crafted with “prints” from The Guardian. Maybe they’ll make you dinner in return? 11: Journalists don’t just write the news, we tend to read it as well. A lot. So don’t overlook something as simple as a subscription to a paper or magazine or even take advantage of the digital subscriptions now so easily accessible on the iPad and other tablets. FYI: some publications offer free digital access with a print subscription and it’s sometimes a better deal. 10: They may be a text master in warm weather, but the cold does strange things to all of us. 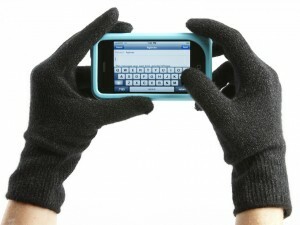 Why not give them some cool gloves that will keep them warm — and stay connected. Agloves has tons of different styles for men and women, and every kind is created to work on touch screens. 9: Gifting to a wonderful woman who just happens to be a journalist? Chances are she’ll love this unique, hand-crafted bracelet made from replica typewriter keys. 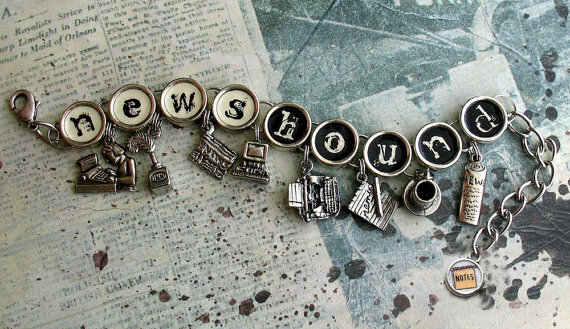 Available on Etsy, it’s a lovely reminder of the news tool we all miss so fondly and also features some reporter-themed charms, including newspapers, quill and computer. 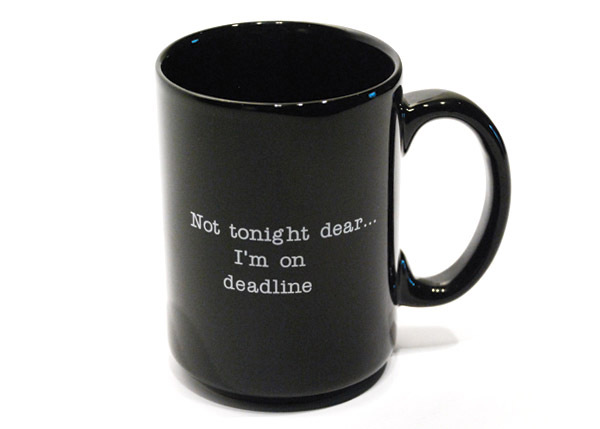 8: What journalist doesn’t drink coffee and feel crushed under the pressure of deadlines? Help them get it on the record with Newseum’s “Not Tonight” coffee mug. It’s also in shot glass form for those who need something a little stronger to make it through crunch time. 7: Especially wonderful for copy editors, we can almost guarantee any journalist will get a kick out of Fake AP Stylebook’s absolutely phony guide. With a title like “Write More Good,” you can’t go wrong. See? We know we’re the most bestest. 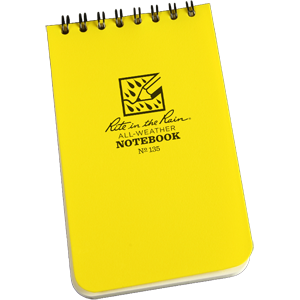 6: If it rains a lot in their location or they report outside in crazy situations, consider gifting something from Rite in the Rain. They have a line of products they’ve put together that are useful for journalists. And with a paper that’s difficult to destroy or mangle, you’ll never have to hear them complain about smudged quotes or torn pages again. 5: We all need friends, especially friends who share a love for the journalism profession. And although some say it’s not true, you can buy them! OK, not really, but you can give the gift of a professional membership that will lead to friends and, just as good, tons of great resources. Personally, we suggest a membership to SPJ, but, of course, we’re biased. 4: For the person always fighting over plugs at Starbucks, you’ll soon be their hero with this gift. Check out the PlugBug. It’s an adapter made specifically for all MacBook power adapters that allows you to charge another USB device from the same plug. Yep, it’s awesome. 3: Because this is a place for freelancers, we had to include something inspiring and motivating for those who need it. 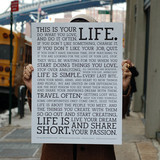 This Holstee Manifesto poster, which swept through the social media world this year, is a beautifully designed reminder to find the passion in your life (and, in this case, your work). 2: Maybe you’re looking for a gift for that person who still loves print, but can’t get away from the internet. We’ve got the coolest gift, although it’s not available until 2012 and we have no idea what it will cost. But we decided to include it anyway because it’s just that cool. 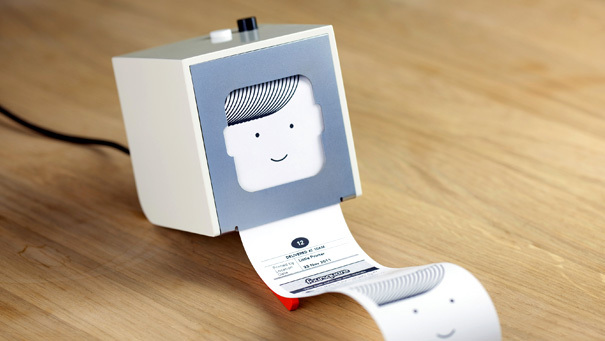 BERG has introduced the Little Printer, a cute little “guy” who pulls your pre-determined data (set up on your phone) from all over the place and prints you a custom news update several times a day. It’s like your own personal wire! 1: From interviews to meetings to conference sessions, this gift will come in handy for anyone on your list. It’s the Echo Smartpen from Livescribe. With just the pen and some nifty paper, audio recordings are easier to maneuver. Just tap a place in your notes and the recording plays just what you’re looking for. The pen really is mightier! There you have it. Gift away! Now, could someone please direct my husband to this list? Do you supplement your journalism income by writing grants? A member of the American Society of Journalists and Authors is moderating a panel on grant writing for journalists at the writers’ association annual conference in New York April 28, 2012 and is looking for panelists. Okay, tax season is over, but I just found a gem — a tongue-in-cheek tax form for freelancers which includes such perks as a Twitter allowance and a working-in-pajamas deduction. If you’ve been living under a rock like I have, and you have a hankering to waste three minutes, check it out. 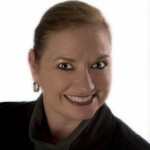 Want to waste wisely invest more time? Check out this post on the biggest tax mistake freelancers (actually) make. Or for a broad overview of tax tips, try this helpful link or this FAQ. Whether you’ve been unmoored from a traditional newsroom or have been working independently all along, if you’re a freelance journalist, we want to hear from you. Guild Freelancers is surveying independent journalists — writers, multi-media producers, photographers, editors, illustrators, filmmakers, webmasters — to learn more about their needs, their work and the marketplace. The resulting data will help us raise awareness about current issues facing freelancers, and will also help us create supports to meet freelancers’ needs. The survey is posted online and takes only 5 to 15 minutes to complete. Log onto http://www.surveygizmo.com/s/536609/2011-freelance-journalist-survey to weigh in.